I was drinking a cup of my Sensuous Skin & Heavenly Hair tea the other day, and I realized it’s time to revamp my skincare regimen for spring! Spring has sprung! That means it's time for you to overhaul your skin care routine to meet the needs of a new season. During the winter, I tend to use heavier and oilier products to combat the dryness wintertime brings to my skin. 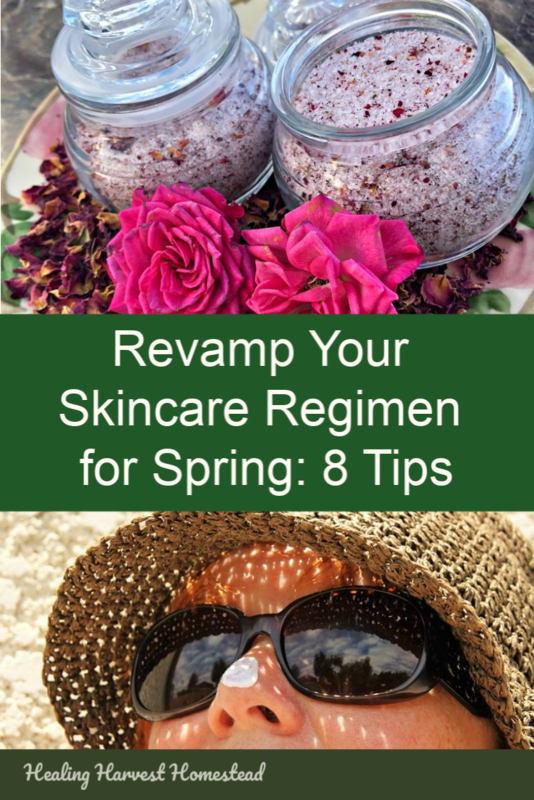 But with the warming of the days, extra humidity, and changing of the season to spring (and on to summer pretty soon), it's time to make some skincare changes to keep looking as great as possible! Here are some tips to help you adjust your face and body care for this beautiful new season! These skincare tips are easy, natural (for the most part), and will help you glow this spring! FTC Disclosure: There are affiliate links scattered throughout this article. If you click through and make any kind of purchase I may earn a small commission at no extra cost to you. I love using the oil cleansing method for wintertime. It really does clean your skin, believe it or not! But the oil can be a bit heavy for springtime skincare. Starting in spring, I clean my skin naturally one of two ways: Raw Honey OR my own handmade soap. Just keeping it simple. Why should you cleanse your face with honey, you might be wondering? Well, honey is anti-fungal and anti-microbial. It's also acidic, and it helps purify your skin. Just take a dollop and rub it over your wet face to give it a nice glow. Use it just like you would a regular cleanser. Rinse with cold water. You'll want to be sure to wash all of it off, though! You don't want to be attracting the wrong kind of attention! You know---bugs! Alternatively---I just use my own handmade soap. Yep. The same soap I use on my body. It's that gentle. You can find directions and the recipe for it here. And if you want complete information about making your own Hot Process handmade natural soap, check out my 93 page eBook! You'll be a master soap maker in no time! Find out how to make your own natural hot process soap! Besides being a broad remedy and cure for many things, honey is great for washing your face! Find out about the healing powers of honey! Exfoliation is the process of removing the upper layer of dead or dying skin cells. What exfoliating does for you (when done on a regular basis), is help keep your skin fresh and dewy. Now, I have mature skin, being in my 50's and all---but I still care enough to keep my skin looking as fresh as possible, even though I may have lost my youthful glow. So, why should you exfoliate? Exfoliating your skin helps remove tired, dead skin cells, leaving a new layer of fresh skin. Helps with cell turnover, which keeps things "fresher." Removing dead skin cells also unblocks pores, which can cause acne or blackheads, even in older folks. Even though exfoliating your skin has tons of benefits, you still need to be careful. Harsh exfoliants or doing it the wrong way can actually damage your lovely skin. In fact, there's new evidence that harsh chemical peels may actually age your skin more quickly in the long run. Your facial skin is one of the more tender areas on your body, so you'll want to be gentle. Using honey, ground up grains, and sugar are my favorite things to use on my face. Well, salt scrubs are harsher than sugar scrubs. You can find out more in this article: Salt vs. Sugar Scrubs: Which is Better? But in the meantime, just know that sugar crystals don't have as sharp edges as salt crystals do. During the scrubbing process, they break down and become spherical, and therefore, more gentle. So, if you are going to use a sugar or salt scrub on your face---go for the sugar. Salt is fine for your body, though. 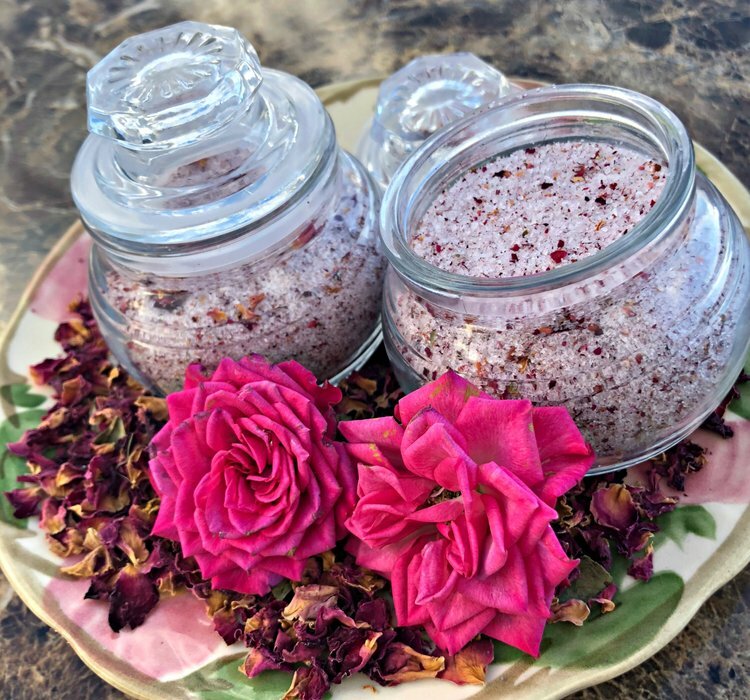 Here are a couple of scrub recipes you might enjoy: How to Make Rose Petal Scrub (best for dry or sensitive skin) and How to Make Juniper-Rosemary Scrub (great for more oily skin). This skin cleansing recipe both cleanses and exfoliates. It's gentle enough to be used every day, too, but still helps slough off dead skin cells. This recipe comes from one of my favorite books: Rosemary Gladstar's Herbal Recipes for Vibrant Health, and has been shared generously by her for many years. ** Optional: Finely ground poppy seeds or blue corn (1/8 cup). Again, I'm not a fan of these ingredients, as I feel they are too harsh unless they are ground VERY finely. Simply mix with some honey and/or water to make a paste. Massage on your face. Rinse with water. NOTE: This scrub makes a great gift too! If you love the way more powerful peels feel, you can replicate this more gently by using certain fruits that contain a substance called bromelain. You'll find your skin feels softer and smoother, even after one round! Pineapple and papaya (which contains a similar substance called papain), are both used often in "natural" exfoliating masks. Rub the fruit part over your skin for a few moments. Rinse well. Experience the difference! Making a scrub for your face and body is EASY. These also make fabulous gifts! During the winter time, I generally use butters to moisturize my skin. Even on my face, I choose oil based serums. Using oils such as Carrot seed, Rosehip, along with fractionated coconut oil or almond oil provides a great nutrient rich moisturizer. Add in some essential oils that are great for your skin, such as lavender or frankincense---and you've now got a high end moisturizer! There are a lot of great diy recipes out there for facial creams. However, I am going to admit to a fail here: I don't like how complicated they can get, especially when you are emulsifying oil with water. Call me lazy. That's ok. I just don't have the time to go there. Maybe one day I will. So unless it is simple oils and butters, I don't make it. Why? Well, emulsifying oils and water means the chances of bacteria growth is very high. You end up having to use a preservative, or it only lasts a few days. That's just not my bag, due to time constraints in my life. This is probably the one area of my life (moisturizing in the spring and summer) where I don't DIY very much. What do I do instead? I try to find the most natural products I can. I just found this company, Blissoma, and I’ve been using their products the past month. I LOVE them. They are natural, and they also work. It’s a small family company, and I tend to trust them more than a large company that’s part of a conglomerate. Another of my favorite brands to use is Juice Beauty. You can find them at any Ulta or Sephora. Or you can find them on Amazon (which is where I now shop because there are no stores that carry it anywhere near me). Here's a link to their Green Apple Age Defy Moisturizer. It's lightweight and pretty darn perfect. I'm not an affiliate specifically for Juice Beauty, but I do believe in the company. They are 90-99% organic, and that's actually a better label than "natural." The word, "natural" these days is pretty meaningless, especially in the food and cosmetic industry. That's because of the FDA's "mis"labeling laws. And I'll just stop right there or I'll be on a rant. That's why, if I do not make it myself, I find companies I can trust to truly be as natural as is commercially possible. Another company I like, too, but costs a lot more (so I rarely buy their items), is the French company L'Occitane. I mentioned them briefly in this article: Which Essential Oils are Best for Wrinkles. It's where I discovered the powers of Helichrysum essential oil! Here is an online shop I recently found that has more natural products brought together from many companies interested in detoxifying their items. It's The Detox Market, and I'm planning to be checking them out! So. While I try to make all of my skincare products, the area of moisturizing during the hot months is rather nebulous. Just being open and honest. Learn how to make your own herbal salves, oils, butters, and balms for healing and healthy skin. Recipes and complete directions. Inflammation caused by seasonal allergies are TERRIBLE for your appearance (puffy eyes, anyone?). Puffiness can also cause your skin to stretch over time, creating extra wrinkles and bags. Ask me how I know. Before I realized how important reducing puffiness in your face is, I couldn't figure out who I always had these bags under my eyes! Then I learned about using herbs (and reducing salt consumption). There are herbs out there that are fabulous to use daily during allergy season. Mullein, Peppermint, Elder, Raspberry, and others are great for reducing inflammation and soothing your sinuses. You can find the recipe for my Allergy Tea in this article. It's easy to make, too! You can also find pre-blended allergy tea blends from Starwest Botanicals. I buy almost all of the herbs I purchase from them, both culinary and medicinal. Herbal Tinctures are less well-known preparations than herbal teas, but they are very powerful and deserve a mention here. I tend to use tinctures more often than teas for most cures because they are so easy to use and take. They are also easy to make, but they do take some time. You can actually tincture the tea mentioned above! Or you can try my favorite allergy tincture recipe. You can find out more about herbal tinctures in this article if you are unfamiliar with them. After being on allergy medications (both OTC and Rx) for decades, once I switched to using herbs several years ago, my allergies have practically disappeared completely. I swear. For me, it's like magic! Allergy tea. Actually, any time you can add herbs to your life, you should. Find out which ones you need, do a little research, and give them a try. That's my personal opinion and advice. They work! Honestly. I love the sun. Now that doesn't mean I go out and bake in it any more like I used to as a young girl before I knew about UV rays and all. But. The sun is GOOD for us! Unfortunately, it's not too great for our skin in large doses. But then. Neither are the chemicals found in commercial sunscreens, makeups, and BB creams. Just saying. There are two kinds of sun protection: Sunblocks and Sunscreens. Sunscreens use dangerous chemicals, and sunblocks may or may not, but they tend to block the sun's rays. I guess it's all about deciding which kind of dangerous you want hitting your skin: The UV rays from the sun? Or potentially dangerous chemicals soaking into your body. The absolute best thing you can do for your skin if you are in the sun is wear a physical barrier of some kind. Hats, the new UV-rated clothes, long sleeves---these are the best. If you must purchase a sunscreen, and I sure understand if you do....Then try Block Island Organics. For a sunscreen, they are a pretty good commercial choice because they don't contain the cancer causing chemicals or hormone disruptors most sunscreens on the market have. You can find out more about sunscreens in this article: Is Sunscreen Dangerous? What You MUST Know About Choosing a Safe Sunscreen. Another company to take a good look at for natural products is The Detox Market. I just found them, and I'm excited to give them a try! Also---if you want to make your own DIY sunscreen, it is possible. There are oils out there that provide a certain amount of protection from the sun, although it's very difficult to put an SPF rating on them. I've personally used all of these oils on my skin, and I can attest that they do work--to an extent. You do have to keep applying them often as they soak into the skin. I'm not a fan of using a lot of olive oil because it has the lowest SPF potential, and it's very thick--not great in the heat. Red Raspberry and Carrot Seed Oils are on the pricier side, too. Physical blocks are the best way to protect your skin from the sun (in my opinion). We all know this: Drinking enough water keeps the cells in our body (including the skin) adequately hydrated. Also, drinking enough water helps our body flush out toxins, too! I know this: When I drink enough water, my whole self just feels better, and I KNOW that translates to my skin, too. We've all heard the standard amount of water to drink every day is 8 glasses, minimum. However, I believe every body is different, and we all need to make adjustments for our own selves. Just keep in mind that when you sweat, you'll need to drink more water. My personal goal is to drink about 65 ounces a day, which is about half my body weight. That seems like an amount that works for me. Drink your water for beautiful skin! This one's another no-brainer, right? When we eat lots of vegetables and whole foods, our skin does better. When we eat processed garbage, out come the zits. At least---that's my personal experience, as well as the personal experiences of many students over the years and my own family. This book by Michael Pollan: In Defense of Food, is one of my favorites that discusses "real" food and what it is. And if you'd like a GREAT book that shares tons of traditional food recipes, you'll enjoy Nourishing Traditions. Sally Fallon, the author, doesn't go into any food eating styles like Paleo, Keto, Vegetarianism, etc. But what she DOES provide in this well-researched book is a lot of traditional food preparation methods used by cultures the world over along with tons of easy, fun recipes. I love this book! Herbs. You just can't go wrong with drinking your herbal nutritive teas every day. Plants and teas high in anti-oxidants (Rooibos, Black tea, Green tea, etc.) are some of my favorites. And Dandelion, Nettle, Raspberry, etc. are all nutrient dense. You can find out more about basic tea (Camellia sinensis) in this article. At any rate---eating right is great for your skin! Pineapple is great for your diet and health! It's also a great skin exfoliator as it contains bromelain. Want to learn to blend your own healthy teas? Find out all the basics in this Tea Guide! I tend to sweat when it gets warm. And any make up I wear just sweats right off too. I've learned, as a more "aged" woman, that less is more these days. Heavy makeup just doesn't work in high humidity or heat. Nor does it work with wrinkles. Truly, the best thing you can do for your appearance if you need to wear makeup (as I do to an extent) is lighten it up. I use a really lightweight concealer, a bit of mascara, and my lipstick/stain does double duty as blusher. That's it. Keep it simple in the Spring and Summer, at least for every day. Maybe someday I'll try making my own make up. There are some websites out there with some good instructions, like Humblebee and Me; but I'm not even close to having that kind of time these days. Someday. Perhaps. You know what? You can put all the bandaids on yourself you want...but the best thing you can do to take care of your skin in all seasons is to treat your body right. Making your own products is the best thing you can do. After all, you know exactly what's in them. But given that we all just don't have that kind of time, do some research of your own so you can find the best, most natural alternatives on the market. Another wonderful appearance tip is to just….SMILE! Smiling does wonders for your look. Hopefully this was a helpful article for you! If you have ideas or have tried other things that aren't included here, please leave a comment in the comments section! We'd love to hear from you! P.S. If you haven't already, go ahead and sign up for our newsletter! Guess what! When you do, you’ll get free and immediate access to the Resource Library! It’s filled with great mini-eBooks, guides, checklists, and cheat sheets to support you on your self-reliant healthy journey! I am not a medical doctor or beauty aesthetician. The information in this article is for informational purposes only and not meant to treat, cure, diagnose, prevent, or fix any health or beauty problem. Please seek advice from your medical professional before using any herbs or essential oils. These statements have not been evaluated by the FDA. Want great skin? Here's how to revamp your skincare routine for Spring! Find out 8 great all natural ways to get better skin right now. Do these natural things, and your skin will glow! Facial cleanser recipe, how to exfoliate your skin naturally, and lots more!